Heat oven to 350°F. In ungreased 12-inch pizza pan, break up cookie dough. With floured fingers, press dough evenly in bottom of pan to form crust. Bake 15 to 20 minutes or until golden brown. Cool completely, about 30 minutes. Meanwhile, in medium bowl, beat cream cheese, peanut butter, powdered sugar and milk until smooth. Fold in whipped topping. Spread 1/2 cup of the fudge topping over cooled crust. Spread peanut butter mixture over top. Drizzle with remaining 1/4 cup fudge topping. Sprinkle with peanuts. Refrigerate at least 30 minutes or until serving time. Cut into wedges or squares. Did you know? Pillsbury has a gluten free cookie dough. 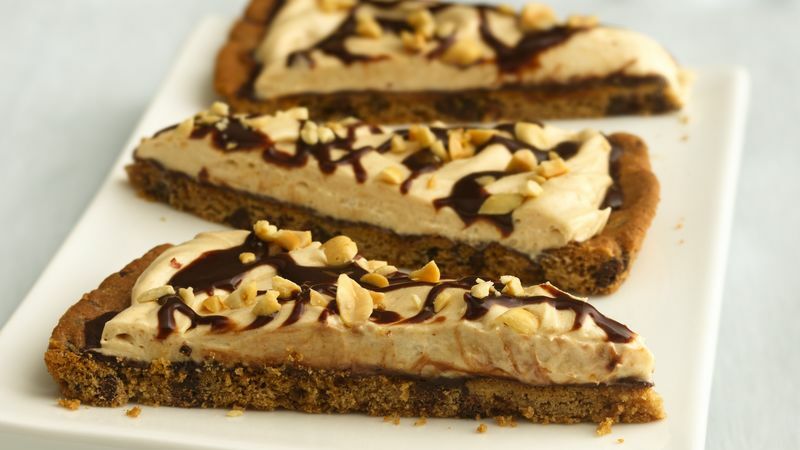 Prepare the cookie pizza crust up to a day ahead of time. After it's cooled, wrap it tightly in plastic wrap and store at room temperature until you're ready to top it off.